July Is the Month to . . . Photos by Edwin Remsberg, unless otherwise noted. 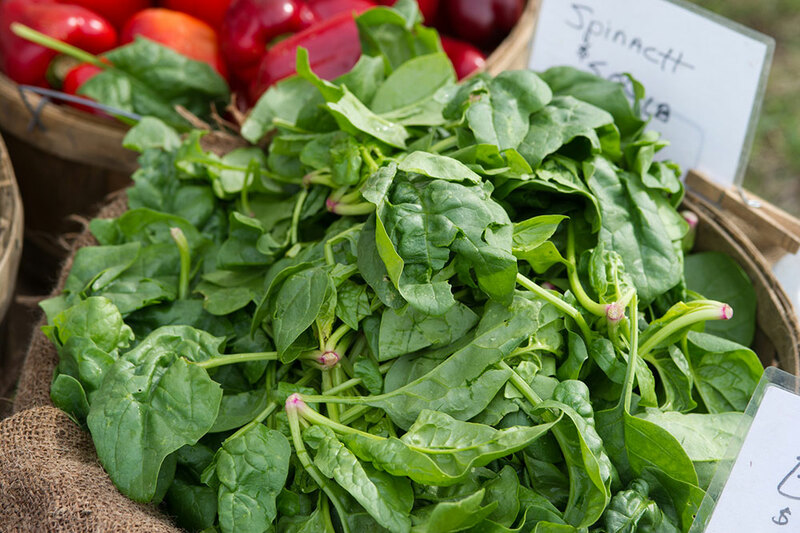 Support your local farmer by shopping at a farmers’ market. The vibrant farmers’ market scene in Maine offers shoppers a fun way to access fresh food from friendly, hard-working farmers. 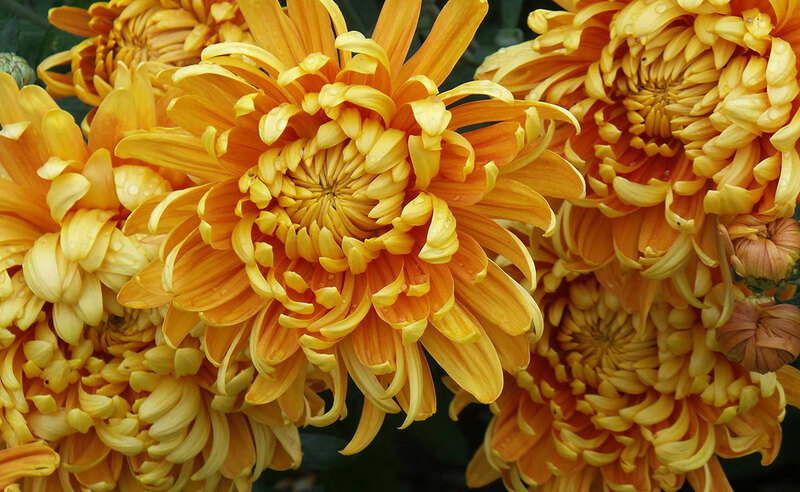 Remove old flower buds from ornamental plants. 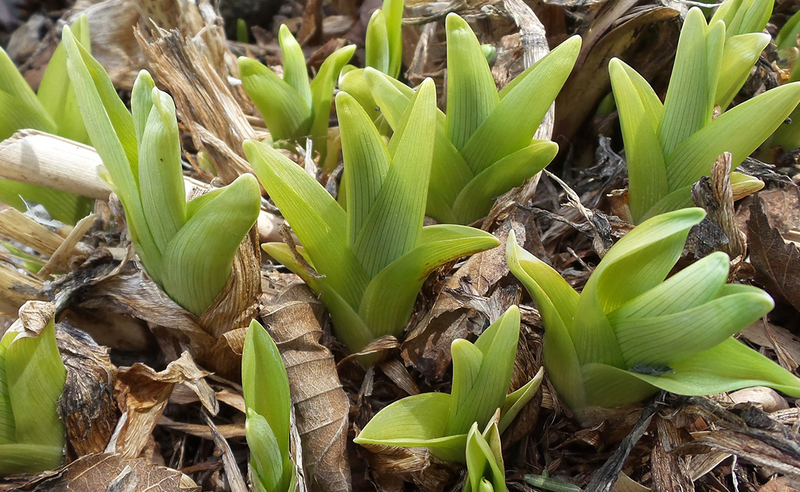 Unless you are trying to save seed or the plant has decorative seed heads, it is a good practice to remove old blooms. Scout for adult potato bugs, their bright orange egg masses, and their red, soft-bodied larvae. Hand picking adults and destroying egg masses early in the season will greatly reduce the impact this pest will have on your potato crop. Colorado Potato Beetle (left) and eggs (right). Savor strawberry season. UMaine Extension has resources on freezing, making jam, how to grow strawberries, handling and storage, and delicious, healthy recipes. Replant! Check the number of days to harvest on seed packets and compare this number with the last freeze/frost date for your area to get a sense for whether it’s reasonable to replant crops. In many cases, you can still get away with planting beans, beets, carrots, leafy greens, and peas. While you’re at it, plan ahead to use season extension strategies this fall. Be aware of ticks. Learn about how to submit a tick for ID, tick species of Maine, tick biology, tick removal, tick management, and see photos of ticks. Add a rain gauge to your garden. Water needs within the landscape often vary, but most newly planted edible and ornamental crops need 1 inch of water a week. Mow lawns at the highest setting and leave clippings where they fall. Follow the guidelines in our lawn bulletins and videos for beautiful and low maintenance green spaces. Visit a public garden. 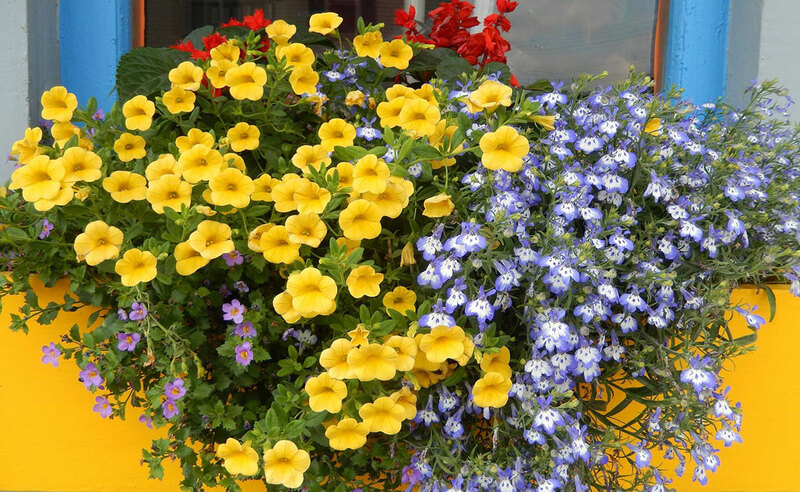 Here is a partial listing of some well-known public gardens in Maine. Wear sunscreen and reduce sun exposure. Apply sunscreen products first if also using insect repellent. Create a garden memory with a child. Many gardeners get their start because of a caring adult who shared just a little bit of their time and a bite of their harvest. Bring a young neighbor, friend, or family member into your garden to plant that second crop of beans, cut a few colorful flowers, or save some of your pea harvest for a pair of little helper hands. Many gardeners may not realize that a lot of the early spring crops we love to grow such as spinach, lettuce, broccoli, kale, radishes, carrots, and peas, can be planted again in midsummer for a sweet fall treat. It can take surprisingly little effort to extend the harvest season all the way into December. Cool season crops planted in late July through early September will only sweeten with cooler fall temperatures and many types can withstand a light freeze. The trick is to get your fall crops planted at the right time, as planting dates differ among cool season crops. 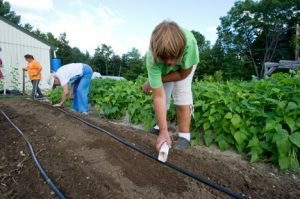 The table below lists recommended planting dates (for Maine gardens) for a few favorite fall crops, but you can also check the number of “days to harvest” listed on seed packets and the fall frost date for your area to determine whether the crop will fit in the growing window you have to work with. One of the biggest challenges with sowing seeds mid-season is keeping the soil moist for seeds and young plants. Be sure to keep soil moist until germination and water seedlings deeply once every week unless rainfall amounts are greater than 1” per week. Covering summer planted crops with light organic mulch such as grass clippings (from untreated lawns), chopped leaves, or straw will keep the soil moist while the seed is germinating and assures much a much better percent seed germination rate compared to non-mulched seeds. Many seeds companies have special sections on their websites with planting charts for fall cool season crops. With a little planning you can extend your garden season with delicious and nutritious greens well into December. Add a spun fabric row cover such as Reemay or Agribon to boost your planting bed temperatures by 2-3 degrees with the added advantage of serving as a physical barrier from insects that may attack your tender seedlings. Row covers are easy to put over wire hoops and can be attached to the wire with clothespins. 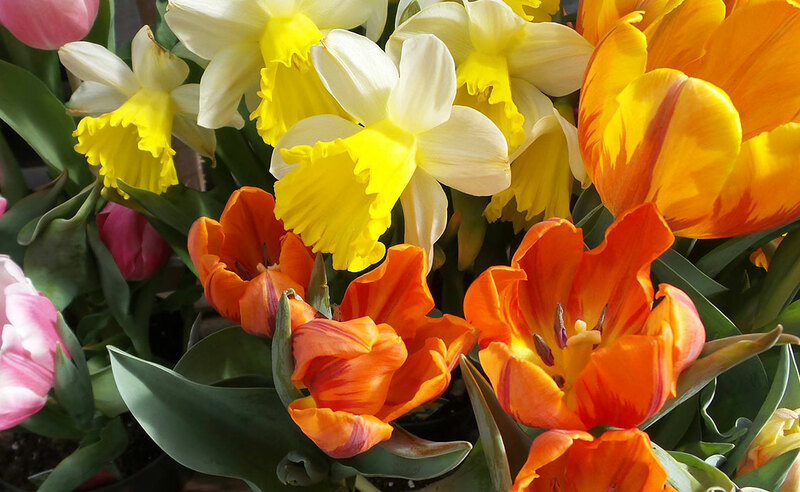 For more information, see Bulletin #2752, Extending the Gardening Season. Don’t forget to plant hardneck garlic in mid-October. Mulch well after a few hard frosts. See Bulletin #2063, Growing Hardneck Garlic in Your Maine Garden for more information. Peony (Bandit). Photo by Tori Jackson. Growing up in a family of avid vegetable gardeners, much more emphasis was placed on the quality (and quantity) of our tomato plants than ornamentals. Sure, we would have the standard annuals in planters or around a few trees, but there was really only one perennial we could count on and look forward to every year: the peony. Large, showy blossoms on tall, spindly stems boasting a fragrance more rose than rose. It is absolutely intoxicating. 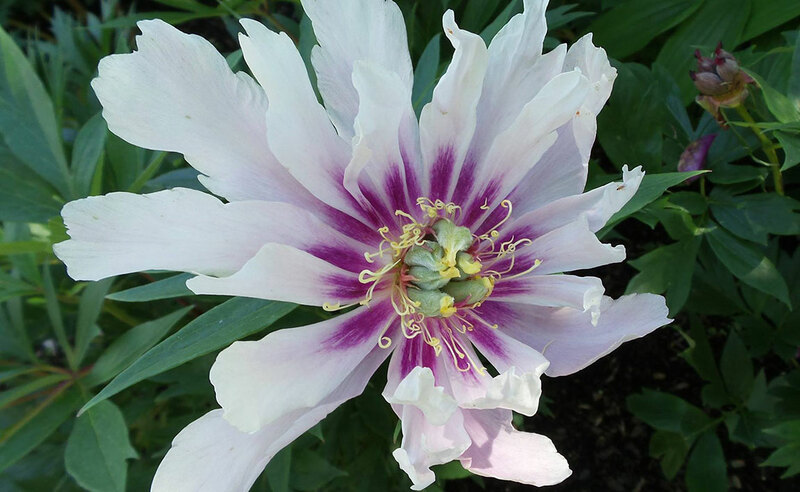 Many Maine yards have at least one peony somewhere, usually with a homemade staking or trellis system to keep them upright once the perfectly round buds have burst into heavy flowers. The season for blossoms (if you have several varieties) can be as long as six weeks, but these plants offer attractive foliage that look great in your garden throughout the growing season. We often think of some of the most beautiful plants in our gardens as “finicky” and not for beginners, but peonies are by most accounts not only one of the most stunning plants, but also easy to grow and very long-lived as well. Peonies should be planted in well-drained, loamy soil with a pH between 6.5 and 7. Many of our Maine soils are more acidic than that, so be sure to lime according to your soil test to bring the pH up a bit. 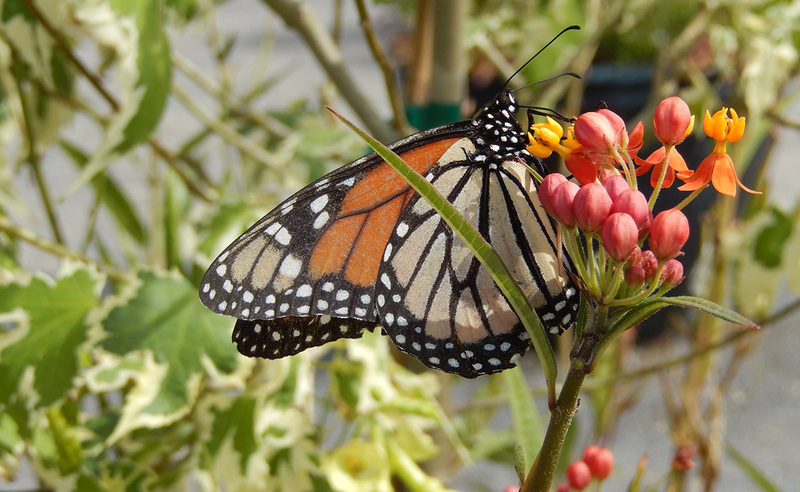 New plantings may take 2-3 years to establish before blooming, but will perform consistently with little intervention save for providing adequate water and fertility, when necessary. Peony (Feather-Top). Photo by Tori Jackson. 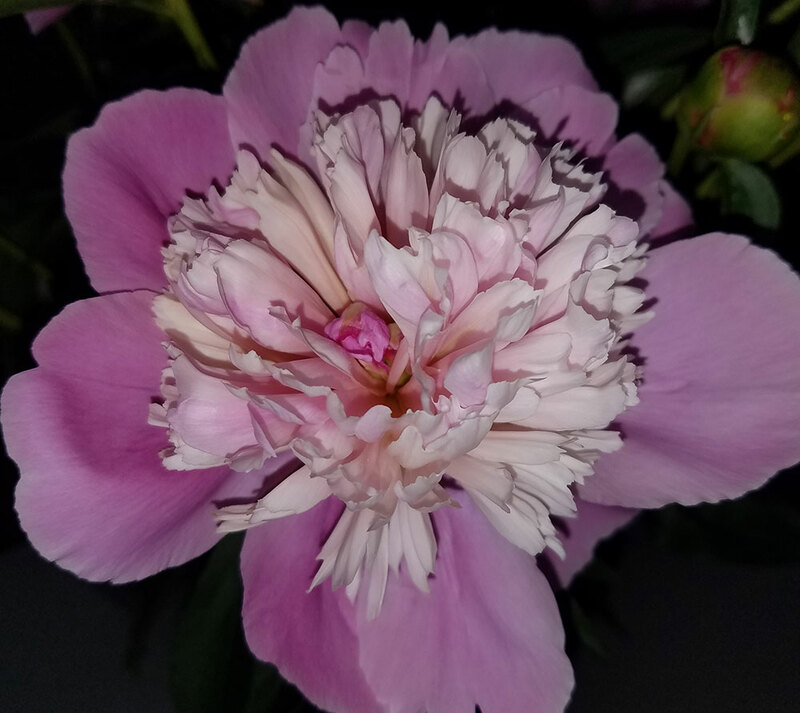 In a damp year, there are a few diseases to watch for, including botrytis (gray mold), anthracnose, leaf blotch and Cercospora Leaf Spot, but in a dry spring like this one, many peonies are having a banner year with dozens of perfect blossoms in pinks and whites, reds and yellows. Each June, the Peony Society of Maine offers tours — a great opportunity to see the great diversity of colors that can be grown here. Taking photos and making notes now will serve you well later in the season, as Fall is the best time to divide and plant peonies. 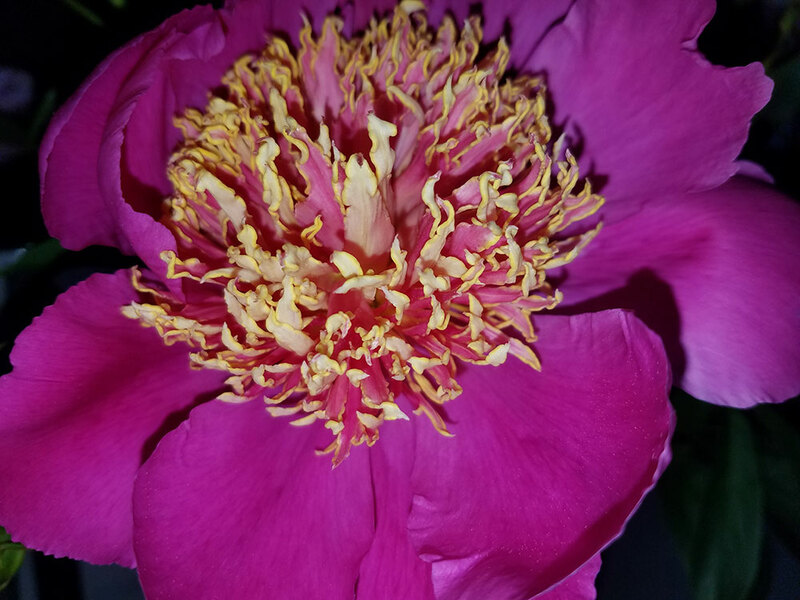 Source: Peonies, Prepared by Karen Russ, HGIC Horticulture Specialist, and Bob Polomski Extension Consumer Horticulturist, Clemson University. (New 04/99. Images added 05/09.) PDF accessed on June 14, 2016. Display garden at Tidewater. Photo by Amy Witt. 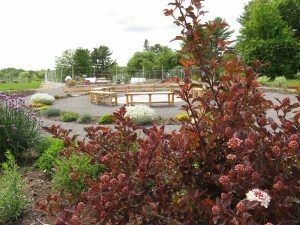 The University of Maine Gardens at Tidewater Farm in Falmouth are a project of the Cumberland County Master Gardener Volunteers. The intent of these educational and demonstration gardens is to teach youth and adults how to garden and grow their own food, and promote sustainable gardening practices for food production and ecologically compatible landscapes. The Gardens began in a historic hay field. In the past four years they have blossomed into a wonderful outdoor classroom space for Master Gardeners and people of all ages to gather and learn new gardening skills and techniques (like beekeeping, vertical gardening, or which plants are good companions for orchards), harvest fresh fruits and vegetables for local food pantries, learn about new plant varieties, or just walk around and experience the beauty of the gardens and surrounding landscape. The Cumberland County Master Gardeners have worked diligently to create this wonderful resource and it continues to grow each season. 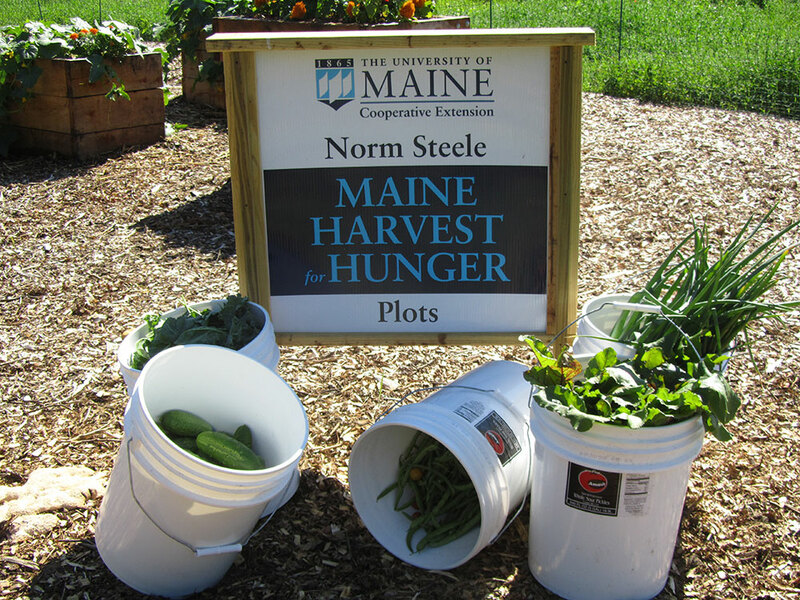 The foundation for the Gardens is the Norman Steele Harvest for Hunger Plot, which raises fresh produce for local people in need. Norm, one of Cumberland County’s first Master Gardeners, was an inspiration to all who met him and growing food (especially onions) for people in need was his passion. 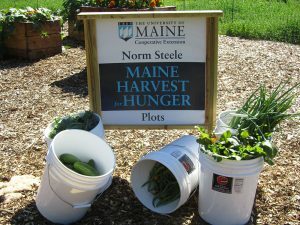 Norm passed away three years ago and it was only fitting that we named our Harvest for Hunger garden after him. The sixteen raised beds in this area have produced over 2500 pounds of food in the past four seasons. All of the produce raised in this garden has been donated to local food pantries. small orchard featuring stone fruits. Our focus for the Gardens in 2016 is youth. 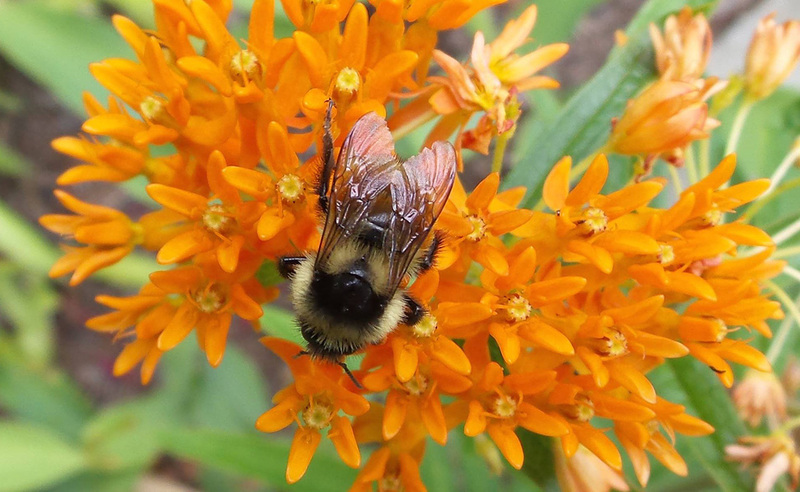 We will be creating a new children’s garden and are providing a variety of youth-focused educational programs, including a special 4-H club to learn about the benefits of pollinators. The Gardens are also serving as a site for summer recreation program field trips. Being completely self-sustaining, it is necessary for us to raise the funds to keep the Gardens going. One way we do this is with our annual fundraising event, A Taste of Tidewater. This year’s event takes place on Saturday, August 20. The proceeds will be used towards the creation of the children’s garden. 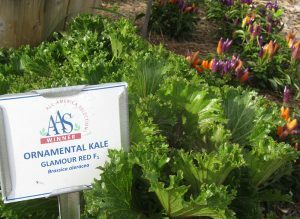 Ornamental Kale in the AAS garden at Tidewater. Photo by Amy Witt. Various programs and classes are offered throughout the season. 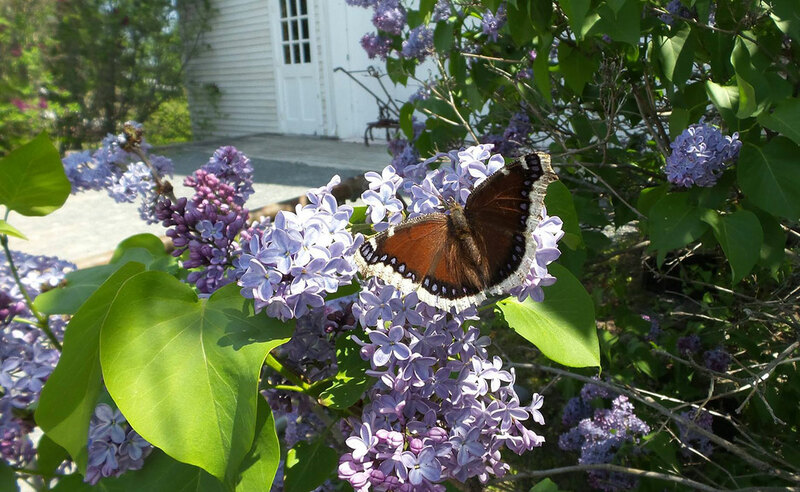 Visit the UMaine Extension Cumberland County website for a current calendar of events and more information about the Gardens. All are welcome to tour the UMaine Gardens at Tidewater Farm. Come anytime from dawn to dusk to walk around and take in the beautiful setting. Directions: Take Route 1 to Falmouth; turn onto Clearwater Drive (next to Walmart), and then take a right onto Farm Gate Road. Sometimes our appetites can’t keep up with the amount of spinach, kale, and chard harvested from the garden. Freezing is an easy way to preserve greens for using later in soups, stews, and casseroles. 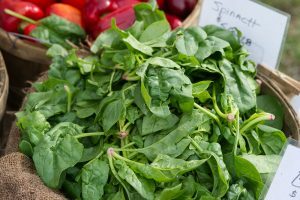 Frozen greens will not thaw well for fresh uses, so for best results, add home frozen greens to cooked dishes. To freeze greens, harvest them at the peak of ripeness, before they flower or bolt. Wash greens well, remove stems, and cut into bite-size pieces. Blanch (dip briefly in boiling water) greens before freezing for best quality. Place up to 6 cups of greens into 1 gallon of boiling water and blanch for 2 to 3 minutes. Remove greens from water and transfer into an ice bath (bowl of ice water). Let greens sit in ice bath for 2 to 3 minutes, to avoid overcooking and to cool. Dry greens using a salad spinner or clean kitchen towels. Pack into freezer-grade plastic or glass containers, label and date, and place into freezer. Do not attempt to freeze more than 2 pounds of food per cubic foot of freezer capacity per day. Greens should be used within 4-6 months for best quality. See Bulletin #4040, Let’s Preserve Leafy Greens for more information on freezing greens. Melt butter in 9” pie pan, and spread on bottom and sides of pan. In a bowl, beat eggs well, add flour, milk, garlic, and baking powder. Add to the pie pan. Stir in cheese and kale. Bake for 30-35 minutes until edges are brown and firm all over.